Nandina was proud to be a part of a very special project this week. We love when we have the opportunity to give back to our community, especially when design is involved! 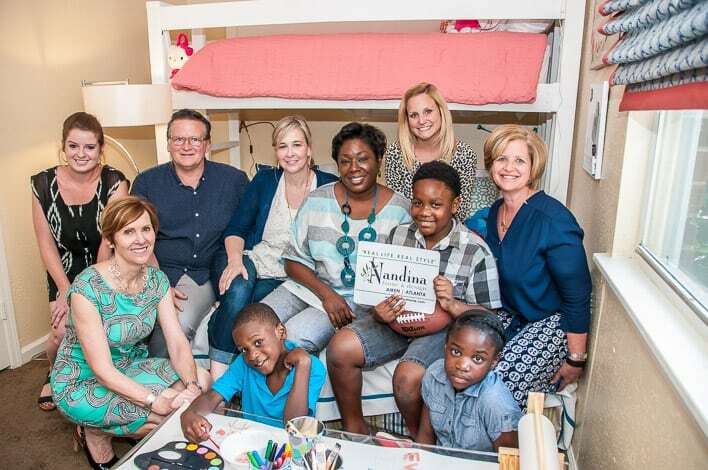 We teamed up with Dwell with Dignity and Buckhead Christian Ministry to design a home for a deserving family in Atlanta. After two weeks of intensive planning and 2 days of installation, we were able to give this family the beautiful, serene home that they deserve. One of our favorite design challenges is adding function to small spaces. For a family of five living in a two-bedroom apartment, storage is key. Designer Chanel Katic pulled out all the stops to find creative storage solutions. Since the family shares the only bathroom, she created a custom storage piece with the help of The Container Store. Now, the family has a stylish way to store towels and toiletries. The apartment lacks a linen closet, so the team refinished a bamboo 2-door cabinet for the hallway which functions beautifully. The TV console has ample storage for dvds, video games, and books. I thought it would take us years to get to a place where we could afford stuff like this. It’s so nice, I can’t believe it. The family of five were overwhelmed as they walked through their new home, barely recognizable from the home they left only 3 days prior. Lead designer Chanel Katic met with the family beforehand to get a sense of their style and needs. In the end, she went with a serene navy blue and green scheme for the living room, while the master bedroom became a tranquil retreat with a palette of beige and deep purple. I love the colors. I feel like this is the kind of stuff I’d pick out myself. Another challenge came in the kids room, where we mixed up the décor to function for both the two brothers and their sister. Chanel chose teal and navy blues, but added pops of coral to the girl’s top bunk. Before, the siblings were forced to share beds. We were able to add some separation between the siblings by using and extra long vaulted twin bed with two twin beds underneath. It was so important to us that each sibling had their own space. I’m really proud of the solution we came up with. This is the first time that all three kids have their own bed. With a small budget, materials and furniture were reused and upcycled whenever possible. Many pieces were donations from the Dwell warehouse and the Nandina warehouse. Many of these items were sitting unused due to manufacturing errors or small scratches. We used remnants of fabrics from other projects to make window treatments, bed skirts, and pillows. The donated sofas were reupholstered with leftover fabric to breathe a new life into them. The team at the Nandina Atlanta work room did an amazing job getting everything completed on time. Donated casegoods, such as the TV console, kitchen chairs, hall cabinet, kids dresser, and secretary desk, got a new life with a few coats of paint. The lamps were provided by Currey & Company. The beautiful new bedding in both bedrooms was donated by Peacock Alley. Much-needed storage was added to the pantry and closets thanks to the help of The Container Store. We’ve been lucky to foster some wonderful relationships within the design community in Atlanta. This all wouldn’t be possible without the generous donations we receive. I’m so thankful for all the volunteers who spent countless hours organizing, designing, creating, gathering, documenting and putting it all together. It is such hard work, but so worth it. With only a few weeks between the initial design consultation and the final install, it took the whole team to pull this project together. Designer Chanel Katic took the lead with assistance from John Ishmael and the rest of the Nandina design team. In the end, we were all thrilled to see how the project came out. Seeing the reaction of the family to this space made everything worth it, and reminded us of why we love what we do!